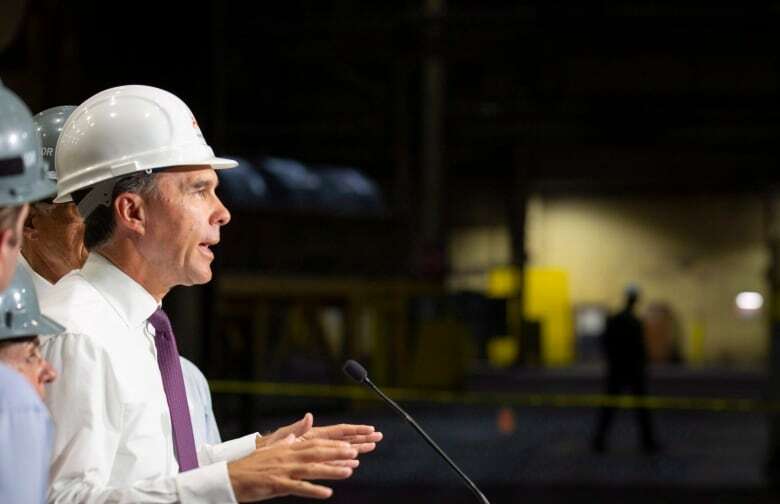 The Canadian International Trade Tribunal is expected to release its report late Wednesday on Finance Minister Bill Morneau's use of emergency safeguard measures to shield Canada's domestic market from seven types of foreign steel. A three-person panel held hearings Jan. 7-24. Morneau has until May 12, when his provisional surtaxes are set to expire, to consider the panel's advice. "The provisional safeguards have been working and are very important to stabilizing our marketplace," said Catherine Cobden, president of the Canadian Steel Producers Association. "Our view is strong that we need to see those continue," she said, adding she hopes to see the surtaxes stick around for the next three years. But businesses who rely on an affordable supply of steel have been sharply critical of the finance minister's measures, which they say take already tough global market conditions and make them worse. The panel may offer different recommendations for each of the seven products targeted: heavy plate, concrete reinforcing bar, energy tubular products, hot-rolled sheet, pre-painted steel, stainless steel wire and wire rod. "Final safeguards are warranted across the board," Cobden said, calling them "critical for all seven products." On Oct. 25, Canada began applying a provisional surtax of 25 per cent on foreign steel shipments that exceed thresholds based on historical trade volumes for each product. Normally, governments collect evidence of harm done by imports before applying surtaxes. In this case, surtaxes were imposed in advance of an investigation of their merits. Was there a harmful 'surge'? Canada has separate tariffs in place for U.S. steel imports. Those tariffs are retaliatory, imposed after the U.S. slapped "national security" tariffs on Canadian steel and aluminum last July. Wednesday's report is not about the tariffs on American steel. But the Trump administration's decision to slap a 25 per cent tariff on all foreign steel imports risked diverting cheap, foreign steel shipments previously destined for U.S. customers into Canada. The panel must decide whether Canada faced a surge of foreign imports in the third quarter of 2018 and, if that surge happened, whether an influx of foreign steel caused significant injury to domestic steel producers. A yes to both questions would provide a strong rationale for Morneau to continue the safeguards. But if the panel doesn't find a surge occurred for some or all of the products in question, or finds no evidence of harm done in Canada, the minister's case for continuing the measure will be weakened. The emergency safeguards don't apply to imports from the U.S. Provisional surtaxes added to two types of Mexican steel were lifted in a memorandum of understanding (MOU) reached between Canada and Mexico on Jan. 16, right in the middle of the tribunal's hearings. But the MOU was not disclosed until after the hearings concluded. James McIlroy, a trade lawyer who represents a foreign steel exporter, wrote to the tribunal after CBC News revealed the MOU to raise "transparency and procedural fairness issues" over the "non-disclosure of evidence" in the proceedings. During the Jan. 22-24 hearings, McIlroy said, imports into Canada by steelmaker Tenaris of products from its Mexican facility were discussed extensively. Tenaris announced 95 layoffs at its plant in Sault Ste. Marie, Ont. only three days after McIlroy cross-examined their evidence before the tribunal. "Why would Tenaris be entitled to safeguards if all it does is import from [its own facility in] Mexico?" he said. Tenaris, like all the other major steel producers in Canada, is foreign-owned. "It's been a complete debacle from the very beginning ... and that's what's frustrating people," he said. McIlroy said he finds the steelmaker's registered lobbying of the government while the tribunal's proceedings were underway "very troubling." When the panel's report comes out, stakeholders will have these disclosure and fairness issues at the back of their minds and will wonder about political influence in this process, he said. Five countries — South Korea, Thailand, India, Brazil and Russia — made submissions to the tribunal, something McIlroy said you don't usually see. Throughout the hearings, they complained that they weren't allowed to see evidence — something they could use to bring a case against Canada before the World Trade Organization. And the lobbying's not over. "You're going to have five [more] weeks of intense lobbying" between the panel's report and May 12, when Morneau's decision is due, he said. McIlroy predicts the report will recommend an extension of safeguards for some products, but not all. Morneau is under no obligation to follow the panel's advice. The Department of Finance told CBC News last week that "less than $10 million" in gross revenues have been collected under these emergency surtaxes since late October — a figure that struck several industry representatives consulted by CBC News as low, considering the large volumes of traded product in these steel categories. It's the first time Morneau's department has released any revenue figures for these safeguards, despite repeated requests. In December, after the safeguards had been in place for several weeks, the Department of Finance announced "relief" for the surtaxes otherwise payable on steel products that were in transit before the safeguard measures were imposed on Oct. 25. "No estimate is currently available on amount of relief associated with this measure, as it depends on a variety of factors, including the date that shipments have begun their direct journey to Canada," said a written reply to CBC. The $10 million figure is substantially less than the $1.04 billion in net revenue collected by the federal treasury since the implementation of Canada's retaliatory tariffs on U.S. products last July. Finance regularly updates this figure when asked. End-users of this steel, such as Canadian construction companies and other manufacturers, complained to the tribunal about shortages and disruptive cost increases in their supply chains since the implementation of these safeguards. Manufacturers warn that protectionist measures like these could kill more manufacturing and construction jobs than they save at Canadian steel mills. "We are willing and able to meet demand for the products that our members produce," Cobden said, dismissing the notion that Canada has serious supply shortages. "The safeguards allow even those products we produce in. It just keeps it checked to historical levels, so that there's not this big flood of imports coming in, given the big global oversupply that we're facing."